I have a theory: the U.S. is in the midst of another British Invasion. Of course, there was that first one back in the 18th Century, but musically, the first “British Invasion” began in 1964 with The Beatles, then expanded to include dozens of other acts – many of whom are now in the Rock and Roll Hall of Fame. When I began my Top 10 Countdown in 1984, U-K acts such as Wham! and Sheena Easton regularly visited the best-seller lists, and every summer especially, we’d get new names from across the Atlantic. Most of them quickly faded, but it was always fun to hear their slightly different take on American rock and pop. They did so in spectacular fashion, selling 600-thousand first-week copies. That’s the year’s best opening week by a nearly two-to-one margin. How did such a relatively esoteric group perform so spectacularly in a market usually dominated by pop singers and rappers? 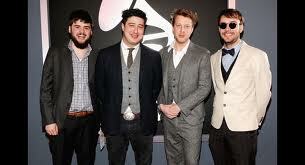 Well, Mumford & Sons helped touch off this current wave with its 2009 debut album, “Sigh No More.” It was an out-of-nowhere hit in the States, selling more than two million copies. Then, last year, the dam truly burst when Adele flattened the competition with her world-beating “21” album. Now 24, she’s already become such an icon that she’s singing the latest James Bond theme “Skyfall,” released on October 5. Looking at the current Hot 100 chart, I count 12 songs from British artists. Several of them are by Mumford & Sons, but there’s enough variety to please most other tastes: dubstep from Alex Clare; pure pop from One Direction and Cher Lloyd; folk from Ed Sheeran, and arena rock from Muse. The music industry is in the midst of a fundamental transition, but one tenet remains: if something works, ride it into the ground. There’s a wealth of Transatlantic talent awaiting Stateside ears, and I’m glad the gates have re-opened long enough for some to seep through. The British Are Coming…Again VOA Music Blog good post. I tought this piece of news would be of interest: Singer Adele is to miss the premiere of the new James Bond picture amid reports she has given birth to a boy. The British star, who sang the theme song for the latest 007 movie Skyfall, was set to stay away from the showing in London to spend time with her son.